At least once every six months, it is prudent to inspect your infrared grill for wear and tear, with specific regard to potential damage to the heating element, infrared plate, and the grate itself. Worn or damaged pieces ought to be replaced prior to subsequent use. Contact your manufacturer if you have questions regarding grill damage, replacement parts, and replacement procedures. In some cases, you may have the option to take your grill to an authorized repair facility. Assuming your infrared grill is in proper, safe working condition, you may proceed with standard cleaning procedure. 1. Clean the grill’s heating element by taking a wire brush and removing any obstructions and debris from the heating element as well as from the burner’s openings. 2. If your infrared grill has a grate: remove the grate and clean off any cooking debris with an appropriate cleaning tool, given the construction of your grate. For example, a metal grate can be cleaned with a wire brush, whereas a cast iron or porcelain-coated grate necessitates a brush with soft nylon bristles (so as not to scratch the grate’s surface). 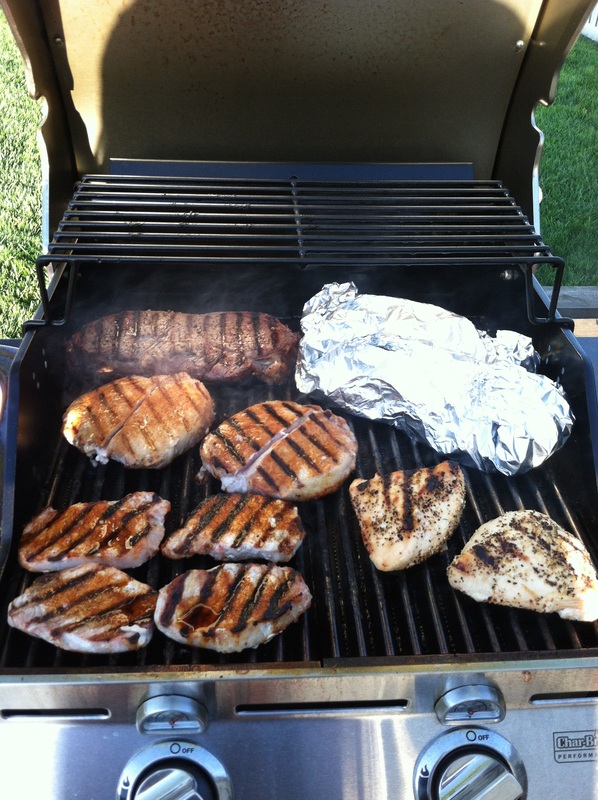 In some cases, turning the grill on to high heat may burn off some of the old food particles, thereby automating part of the cleaning process. Then, wipe down the grate with a soft, damp cloth. If stubborn debris remains, you may use a mixture of mild liquid detergent with warm water to encourage the removal of said debris. 3. Clean your infrared heating surface gently by brushing off old debris. You may also opt for a non-abrasive cleaner to dislodge debris that wasn’t removable with gentle brushing. Routine maintenance after each use of your infrared grill will make this procedure easier, as well as keep your grill running in tip-top shape in between. If you are diligent about wiping down the grate after each use (once the unit has cooled down), it will prevent food from hardening onto the grate. Also, it is helpful to line the grates and infrared emitter plates with a thin coat of high-heat cooking oil after cleaning. This will best prepare your grill for its next use. Top image credit to Weber Grills. Bottom image credit to Weber Grills. One of the most popular new grill features in recent history is the addition of infrared heat, allowing home chefs to cook at temperatures up to 900 degrees, for less than $1,000 for the unit. All infrared grills are operated with gas; they function by focusing the flame into a ceramic tile or stainless steel burner containing many tiny holes. This process converts the heat into infrared energy, providing a hotter food-cooking environment than traditional convection heat. Infrared grills are said to cook food faster and more evenly on account of infrared heat — specifically in regards to ‘the sear.’ Home infrared grills give you the ability to sear a steak for the notorious steakhouse-like taste. Searing is said to form a membrane outside the meat that retains the moisture and juices, while also forming an outer crust from caramelization of animal proteins. 1. Turn on the grill’s gas in accordance with the proper instructions, and turn on the infrared burner. Wait 2 minutes for the burner to achieve optimal heat. 2. Place the meat on a wire rack suspended over the infrared burner. After a minute or so, flip the meat in order to sear the other side. Please note: this will work well with thick cuts of meat like steaks and pork chops; however, the infrared heat can easily overcook thinner cuts, chicken, and fish. 3. Finish cooking the meat to your desired level. This can be accomplished by flipping the meat every 30 to 60 seconds until it is done; or you may opt to move the seared cut to the non-infrared part of the grill and finish cooking it via traditional grill methods. This latter option is slower, but allows for more controlled grilling, and less of a likelihood of charring (on account of the reduced temperature). 4. Remove the meat from your grill and check the inside to verify it is cooked all the way through. Turn off the grill and allow it to cool. Top image credit to Wikipedia Commons. Bottom image credit to Flickr. Every year, you cook a huge turkey to satisfy your hungry family at Thanksgiving. And every year, you end up with pounds and pounds of light and dark meat in your fridge, subjecting everyone in your house to turkey sandwiches for days. Lunch, dinner…even breakfast sometimes…you push the turkey on spouses, children, friends of children, and anyone else who enters your abode. This year, break free from the grips of the leftover turkey sandwich with our selection of the best turkey leftover recipes. After reading this post, you’ll know exactly what to do with your Thanksgiving leftovers, and you’ll be done with all of your turkey before you know it. The pot pie is a classic meal that’s simple and delicious. Give yours a post-Thanksgiving kick by incorporating your leftover turkey into this old standby. Best of all, your kids will devour it before realizing they just ate peas, carrots, beans and celery! Need a recipe for Black Friday morning? Wake your taste buds up with this amazing turkey leftovers recipe. The turkey omelet will taste great any time of day, and you can get creative with the ingredients, depending on your tastes. Turkey soup is a brilliant recipe for leftover turkey that doesn’t take a lot of time and effort. You can easily whip up a huge batch and save some for later, or serve it to all your kid’s friends when they’re over. This easy meal is delicious any time of year, but it’s especially convenient right after Thanksgiving. With the turkey pre-made, it won’t take long to prepare this turkey leftover recipe and pop it in the oven, leading to a filling meal for your family. Give your turkey leftovers a Latin kick with these enchiladas! We love this after Thanksgiving turkey recipe because it turns your turkey into a completely different-tasting food that is extremely enjoyable. The turkey tetrazzini takes a little longer than other recipes, but it’s super simple and delicious. This recipe for leftover turkey will undoubtedly be a hit with the entire family. One of the easiest uses for leftovers is turning them into a salad, and this recipe takes advantage of all that leftover turkey to create a mouthwatering mixture you’ll love. You can serve this turkey leftovers recipe with pretty much anything. If it’s Sunday and you still haven’t worked through all of your turkey, don’t fret! This Thanksgiving turkey leftover recipe is easy to make and perfect for munching on while watching a full day of football. This recipe for turkey leftovers can be whipped up in minutes, giving your turkey a Mexican twist. You can also customize these tacos with any extra ingredients you desire, ensuring that your taste buds never get sick of turkey. With all these recipes for leftover turkey, you should be able to get through all your turkey before the end of the weekend! Enjoy our favorite turkey leftover recipes, and don’t forget to get great deals online with Cyber Monday coupons. Have a wonderful Thanksgiving from Bobby’s Best! In recent years, Halloween companies have taken advantage of everyone’s desire to deck out their homes in the scariest decorations possible, pushing expensive, gaudy Halloween home decorations into the market. However, this wasn’t always the case, and it’s still easy to fill your home with scary yet simple Halloween decorations without giving your wallet a fright. Here are five easy Halloween crafts that you and your children can make without a hassle for your home and front yard. Beach balls don’t have to go into hibernation just because summer is over. Blow up a beach ball, throw a white sheet over it and run a line of twine through the top of the sheet to create an eerie, large ghost for your front porch or trees. This cheap, homemade Halloween prop is great because it lets kids decorate the ghosts however they want, with eyes or mouths or anything. Just grab a Sharpie and let their imaginations run wild! These inexpensive Halloween decorations take advantage of all the paper towel rolls you usually throw out. Instead of just discarding the rolls, turn them into these neat mummies. Cover one end of the roll with self-adhesive wrap (found in the first aid section of your local store) and tape the wrap to the tube. Fill the roll with something that will last, such as hard candy or paper towels, and tape a piece of wrap to the top. Roll more self-adhesive wrap around the entire roll, glue some googly eyes to the front, and voila! You have a paper towel roll mummy. You can also glue paper towel strips or toilet paper to the roll instead of using self-adhesive wrap, but the wrap is easy for kids to use without creating much of a mess. Like the ghosts above, your kids can decorate these mummies however they want and you can easily tape string or twine to the top to make them hanging decorations. Origami crafts are one of the best ways to make cheap, quick Halloween decorations, and these bats are sure to turn out great. For each bat, you need an 8- by 8-inch square of black paper, preferably construction paper. Fold the square in half, to make a triangle. Next, fold down the top two inches of the triangle, at the base, not the point. Fold each of your side flaps in, and then back out slightly above where you folded them in, to create dimensional wings. Cut a notch along the top, between the wings, to give your bat some ears. Finally, flip the bat over and add eyes, with googly eyes or glow in the dark paint. Make a vertical crease down the center to give the bat a more 3-D look, and you have your origami bat! This homemade Halloween decor can be replicated many times to fill your house with bats. Hang them from your ceilings and walls to really create a haunted house. With just pipe cleaners, a small suction cup and a pom-pom, you can make a creepy spider. Wrap 4 pipe cleaners around the suction cup to create the legs, then attach a pom-pom on top of the suction cup to make the spider. Glue googly eyes or small red stones to the pom-pom to give your spider eyes. These easy Halloween crafts are great because they can be made in any color your child desires, and they hardly take any time to make. This easy Halloween decoration gives you another opportunity to repurpose something that would otherwise just sit in your house, as well as use an item you usually just recycle. Save up your gallon milk jugs. When you have enough, use your spooky creativity to decorate the jugs with ghost eyes and mouths in any design you want. This is easier if you leave the cap on, so the jugs keep their shape. Next, cut an inch-wide hole in each jug for the lights. Set up the ghosts close to each other on a path or windowsill, and line some low-wattage holiday lights between the jugs, stuffing some bulbs in each one to illuminate them. These spooky ghosts are the perfect homemade Halloween props for a walkway, on a front porch or in a dimly lit haunted house. As you can see, it’s easy to decorate for Halloween without spending tons of money. Halloween DIY projects are a fantastic activity for you and your children, and you end up with plenty of frightening homemade Halloween decorations to spook your visitors. Top Image credit to gnislew. As part of finishing our basement, we added a bathroom with a tile floor. As we worked on the plans, one thing that I remember from a friend’s finished basement in VT is how cold a tile floor can be on a concrete slab. The first time that I stepped on it in the morning in the winter, I almost jumped a foot. Therefore, when planning our new basement, we once again turned to our friends at Warmly Yours for their individual room radiant floor product. We had used the Warmly Yours product in our last house and had it installed in both the mudroom and the master bathroom of our current home.